De fœtus qu’on fait cuire au milieu des sabbats"
"Any magazine-cover hack can splash paint around wildly and call it a nightmare or a Witches' Sabbath or a portrait of the devil, but only a great painter can make such a thing really scare or ring true. That's because only a real artist knows the actual anatomy of the terrible or the physiology of fear... 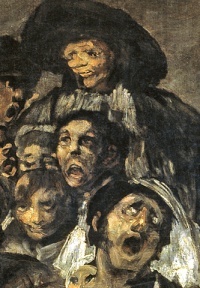 I don't believe anybody since Goya could put so much of sheer hell into a set of features or a twist of expression. And before Goya you have to go back to the medieval chaps who did the gargoyles and chimeras on Notre Dame and Mont Saint-Michel. They believed all sorts of things -- and maybe they saw all sorts of things too..." -- "Pickman's Model", H.P. Lovecraft, 1926. Francisco José de Goya y Lucientes (30 March 1746 – 16 April 1828) was a Spanish painter and printmaker, known for his prints Caprichos and Disasters of War, his Majas and the Black Paintings. Goya was a court painter to the Spanish Crown and a chronicler of history. He has been regarded both as the last of the Old Masters and as the first of the moderns. The subversive and subjective element in his art, as well as his bold handling of paint, provided a model for the work of later generations of artists, notably Manet and Picasso. Francisco Goya was considered skilled but unremarkable until he contracted lead poisoning in his late forties and made the Caprichos. Goya painted the Spanish royal family, including Charles IV of Spain and Ferdinand VII. His themes range from merry festivals for tapestry, draft cartoons, to scenes of war and corpses. This evolution reflects the darkening of his temper, which was in turn influenced by his deafness since 1792. Near the end of his life, he became reclusive and produced frightening and obscure paintings of insanity, madness, and fantasy. The style of these Black Paintings prefigure the expressionist movement. He often painted himself into the foreground. After contracting a high fever in 1792 Goya was left deaf, and he became withdrawn and introspective. During the five years he spent recuperating, he read a great deal about the French Revolution and its philosophy. 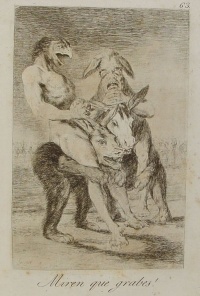 The bitter series of aquatinted etchings that resulted were published in 1799 under the title Caprichos. 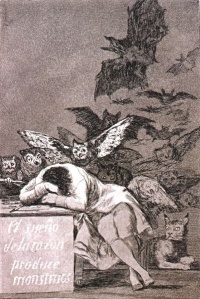 The dark visions depicted in these prints are partly explained by his caption, "The Sleep of Reason Produces Monsters". Yet these are not solely bleak in nature and demonstrate the artist's sharp satirical wit, particularly evident in etchings such as Hunting for Teeth. Additionally, one can discern a thread of the macabre running through Goya's work, even in his earlier tapestry cartoons. When Josefa died in 1812, Goya was painting The Charge of the Mamelukes and The Third of May 1808, and preparing the series of prints known as the Disasters of War. King Ferdinand VII came back to Spain but relations with Goya were not cordial. In 1814 Goya was living with his housekeeper Doña Leocadia and her illegitimate daughter, Rosario Weiss; the young woman studied painting with Goya, who may have been her father. He continued to work incessantly on portraits, pictures of Santa Justa and Santa Rufina, lithographs, pictures of tauromachy, and more. 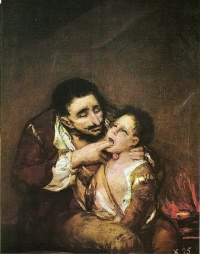 With the idea of isolating himself, he bought a house near Manzanares, which was known as the 'Quinta del Sordo' (roughly, "House of the Deaf Man", titled after its previous owner and not Goya himself). There he made the Black Paintings. Unsettled and discontented, he left Spain in May 1824 for Bordeaux and Paris. He settled in Bordeaux. He returned to Spain in 1826 after another period of ill health. Despite a warm welcome, he returned to Bordeaux where he died in 1828 at the age of 82. The identity of the Majas is uncertain. The most popularly cited subjects are the Duchess of Alba, with whom Goya is thought to have had an affair, and the mistress of Manuel de Godoy, who subsequently owned the paintings. Neither theory has been verified, and it remains as likely that the paintings represent an idealized composite. In 1808 the paintings were seized by Ferdinand VI, and in 1813 the Inquisition confiscated both works as 'obscene'. In a period of convalescence during 1793–94, Goya completed a set of eleven small pictures painted on tin; the pictures known as Fantasy and Invention mark a significant change in his art. These paintings no longer represent the world of popular carnival, but rather a dark, dramatic realm of fantasy and nightmare. Courtyard with Lunatics is a horrifying and imaginary vision of loneliness, fear and social alienation, a departure from the rather more superficial treatment of mental illness in the works of earlier artists such as Hogarth. In this painting, the ground, sealed by masonry blocks and iron gate, is occupied by patients and a single warden. The patients are variously staring, sitting, posturing, wrestling, grimacing or disciplining themselves. The top of the picture vanishes with sunlight, emphasizing the nightmarish scene below. 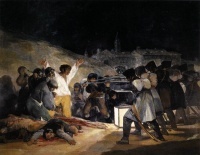 As he completed this painting, Goya was himself undergoing a physical and mental breakdown. It was a few weeks after the French declaration of war on Spain, and Goya’s illness was developing. A contemporary reported, “the noises in his head and deafness aren’t improving, yet his vision is much better and he is back in control of his balance.” His symptoms may indicate a prolonged viral encephalitis or possibly a series of miniature strokes resulting from high blood pressure and affecting hearing and balance centers in the brain. Other postmortem diagnostic assessment points toward paranoid dementia due to unknown brain trauma (perhaps due to the unknown illness which he reported). If this is the case, from here on - we see an insidious assault of his faculties, manifesting as paranoid features in his paintings, culminating in his black paintings and especially Saturn Devouring His Son. "...the innumerable foibles and follies to be found in any civilized society, and from the common prejudices and deceitful practices which custom, ignorance, or self-interest have made usual." 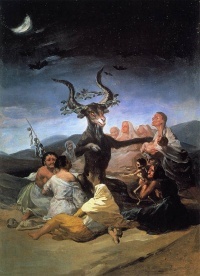 In later life Goya bought a house, called Quinta del Sordo ("Deaf Man's House"), and painted many unusual paintings on canvas and on the walls, including references to witchcraft and war. One of these is the famous work Saturn Devouring His Sons (known informally in some circles as Devoration or Saturn Eats His Child), which displays a Greco-Roman mythological scene of the god Saturn consuming a child, a reference to Spain's ongoing civil conflicts. Moreover, the painting has been seen as "the most essential to our understanding of the human condition in modern times, just as Michelangelo's Sistine ceiling is essential to understanding the tenor of the 16th century". This painting is one of 14 in a series called the Black Paintings. After his death the wall paintings were transferred to canvas and remain some of the best examples of the later period of Goya's life when, deafened and driven half-mad by what was probably an encephalitis of some kind, he decided to free himself from painterly strictures of the time and paint whatever nightmarish visions came to him. Many of these works are in the Prado museum in Madrid. In the 1810s, Goya created a set of aquatint prints titled The Disasters of War) which depict scenes from the Peninsular War. The scenes are singularly disturbing, sometimes macabre in their depiction of battlefield horror, and represent an outraged conscience in the face of death and destruction. 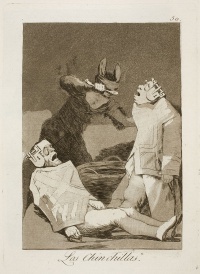 The prints were not published until 1863, 35 years after Goya's death. Among his pupils were Agustín Esteve. Enrique Granados composed a piano suite and later an opera called Goyescas inspired by the artist's paintings in 1916. Gian Carlo Menotti wrote a biographical opera about him titled Goya (1986), commissioned by Plácido Domingo, who originated the role; this production has been presented on television. He also inspired Michael Nyman's opera Facing Goya (2000), in which he appears in the present to protest the use of his skull in racist science, for which reason the historical Goya had his skull hidden and not buried with the rest of his body. Goya is the central character in Clive Barker's play Colossus. In 1988 American musical theatre composer Maury Yeston released a studio cast album of his own musical, Goya: A Life In Song. Plácido Domingo again starred as Goya, with Jennifer Rush, Gloria Estefan, Joseph Cerisano, Dionne Warwick, Richie Havens, and Seiko Matsuda singing supporting roles. Music and lyrics were by Yeston, and the recording was released by CBS/Sony (483294-2). The score featured one break-out song, “Till I Loved You,” sung by Placido Domingo and Gloria Estefan. It was subsequently a Top 40 hit by Barbra Streisand. In spite of that commercial success, the piece has not received a major staging. An episode of the television series "Criminal Minds includes numerous references and allusions to Goya. The standard quote near the beginning of the episode is "Fantasy abandoned by reason, creates...monsters." At various times when we see the antagonist's quarters, whether in prison or at home, he is surrounded by Goya works, specifically the Black Paintings. At some time between late 1792 and early 1793, a serious illness (the exact nature of which is not known) left Goya deaf, and he became withdrawn and introspective. Unless indicated otherwise, the text in this article is either based on Wikipedia article "Francisco Goya" or another language Wikipedia page thereof used under the terms of the GNU Free Documentation License; or on original research by Jahsonic and friends. See Art and Popular Culture's copyright notice. This page was last modified 12:44, 2 October 2017. This page has been accessed 37,685 times.